Net profits in the October-December period were 8.46 trillion won ($7.6 billion), it said, down 31 percent year-on-year. The firm is the flagship subsidiary of the giant Samsung Group, by far the biggest of the family-controlled conglomerates that dominate business in the world's 11th-largest economy, and it is crucial to South Korea's economic health. But now the picture is changing, with chip prices falling as global supply increases and demand weakens. It also has to contend with increasingly tough competition in the smartphone market from Chinese rivals like Huawei—which surpassed Apple to take second place last year—offering quality devices at lower prices. 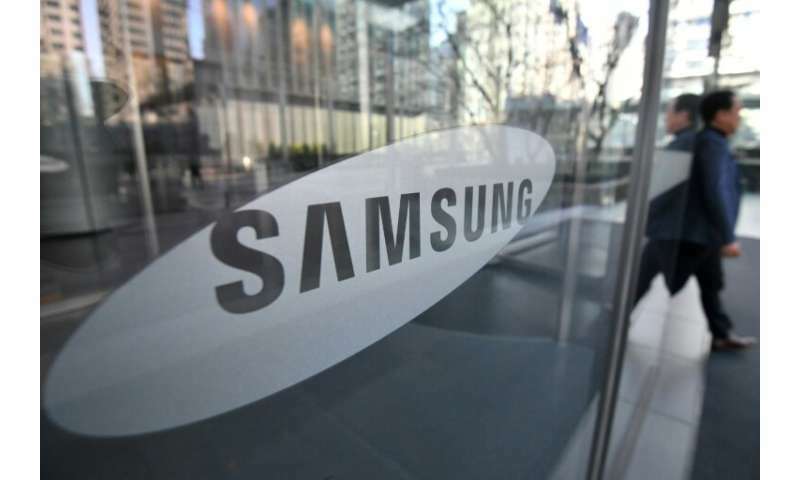 "Unfavourable business and macroeconomic factors led to slower performance in the final quarter," Samsung Electronics said in a statement, when "earnings were affected by a drop in demand for memory chips used in data centres and smartphones." It expected demand for chips to stay weak in the January-March period, "due to seasonality and macroeconomic uncertainties". Weakening overseas demand for memory chips—one of South Korea's key trade items—is bad news for its export-driven economy. Bank of Korea governor Lee Ju-yeol said earlier this month that Asia's fourth-largest economy could face a "considerable burden if the prolonged downturn continues in the semiconductor industry". And Samsung's net profits fall comes as China's economic growth slows, exacerbated by a trade dispute with the United States. Samsung barely mentioned the Asian giant in its earnings statement, but pointed to "global economic volatility" as a cause for "rapidly shrinking" chip demand. The company's display businesses, it said, would be hit by "slow sales of premium smartphones", increasing competition, and "large-scale capacity expansions in the industry". For the full year 2018, the firm reported record net profits of 44.3 trillion won, up 5.1 percent year-on-year. But it projected overall earnings to fall this year, "due to weaker performance by the memory business". The net profit figure came in below analyst estimates, according to Bloomberg News. Samsung Electronics shares closed down 0.54 percent. Greg Roh of HMC Securities & Investment said that "sluggish" sales of DRAM chips—used in computers and servers—and weaker prices were behind Samsung's "weak" fourth-quarter performance. "The first half of this year will be even more challenging," he told AFP, projecting operating profits to fall more than 30 percent year-on-year during the period. Samsung confirmed that it will roll out foldable smartphones and 5G devices this year. It said it was "reorganising" its mass-market line-up "to better promptly respond to rapid changing market trends and the needs of target customers". While it leads the global smartphone market with a 20 percent share, "Samsung is losing ground to Huawei, Xiaomi and other Chinese rivals in the huge China and India markets", Neil Mawston of Strategy Analytics said in a report after the South Korean firm flagged the figures earlier this month. In a bid to attract consumers in China, Samsung launched a series of mid-range phones last year, including the Galaxy A6s priced around $200 and designed by a Chinese manufacturer, which the company said it had never done before. But that did little to restore its sales in the world's largest smartphone market, where it once had a 20 percent share but has seen that tumble to less than one percent in the third quarter. Last month, it announced the closure of its factory in Tianjin. Samsung is not the only tech giant troubled by weak Chinese sales. Apple said in an earnings report Tuesday that its revenue plunged almost 27 percent in the Greater China region in the most recent quarter. The South Korean titan's reputation suffered a major blow from a damaging worldwide recall of its flagship Galaxy Note 7 smartphone over exploding batteries in 2016, which cost the firm billions of dollars. The group's heir, Lee Jae-yong, was also embroiled in a major corruption scandal that ousted South Korean president Park Geun-hye, and he spent nearly a year in jail for bribing her close confidante. The 50-year-old—the son of the current, ailing chairman Lee Kun-hee—was released from prison in February last year after several of his convictions were quashed on appeal.